Graduate or advanced undergraduate students in engineering, science, and mathematics, professionals in engineering and science, such as practicing engineers who want to see how numerical linear algebra problems can be solved using a programming language such as MATLAB, MAPLE, or Mathematica. William Ford received his undergraduate education at MIT in applied mathematics and a Ph.D. in mathematics from the University of Illinois in 1972. His area of research was the numerical solution of partial differential equations, and the results of his work were published in three top-flight journals. After two years at Clemson University, he accepted an appointment at the University of the Pacific in Stockton, CA, where he taught mathematics and computer science. In 1986, he became a founding member of the Department of Computer Science that is now located in the School of Engineering and Computer Science. He served as Chair of the Department for eleven years and retired in 2014 as a recipient of the Order of Pacific, the highest award the University gives. Dr. Ford is the co-author of five computer science texts and two commercial software packages. For many years, he has taught computation for engineers, discrete mathematics, and computing theory. His interest in writing a book on numerical linear algebra arose from working with graduate engineering students. 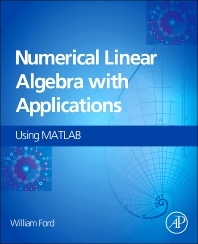 There is a tremendous need for engineers to be familiar with numerical linear algebra and its applications. Dr. Ford saw the need for the subject to be taught at the advanced undergraduate as well as the beginning graduate level. Yet, most engineering students have only applied linear algebra available to them, and books in the subject only touch on numerical aspects. The basics of linear algebra are necessary before a study of numerical linear algebra can begin, but few institutions can afford to offer two separate courses. As a result, he developed a book that in the early chapters provides the linear algebra necessary for a study of how to perform accurate computation in such problems such as solving general and specialized square linear systems, least-squares, computation of eigenvalues, and the iterative solution of large, sparse systems. The book contains many computational exercises and carefully chosen written exercises. Some of these written exercises introduce methods not directly covered in the text but, in each case, the method is developed in understandable parts. The same is true of proofs, and hints are provided for the most difficult problems.